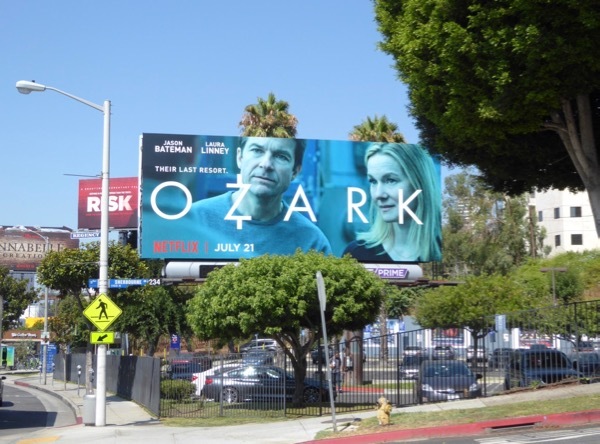 When Netflix launch an original series they really go all out to make it seen in the city skyline, and this outdoor ad campaign for new drama Ozark is no exception. 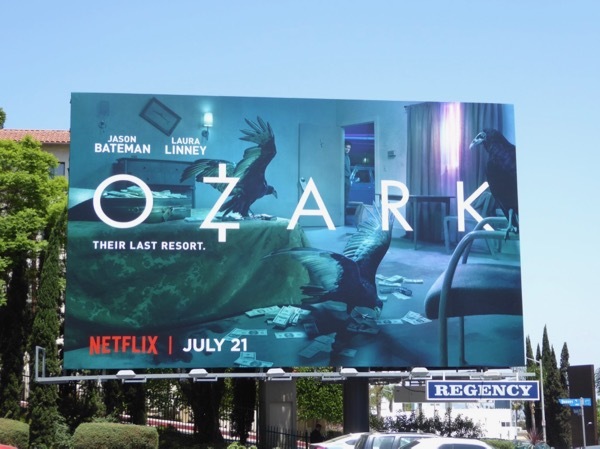 The blue-green colour scheme, seedy motel room and swimming pool locations and menacing crows certainly gives the show an eerie feel. 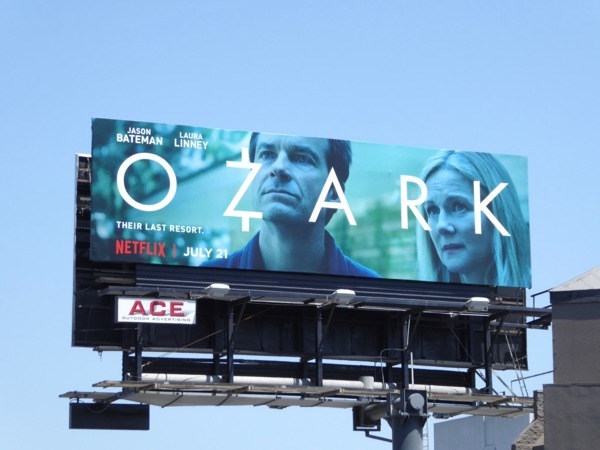 The dark drama stars Jason Bateman (who also defect several episodes) as a clean-cut financial planner living in Chicago with his wife (played by Laura Linney) and family, who finds himself forced to relocate them all to live in the Missouri Ozarks when he lands in trouble with a Mexican drug lord named 'Del'. 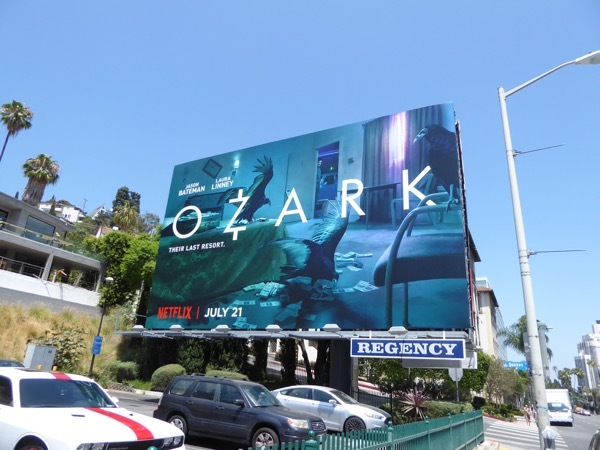 Turns out he's been skimming profits with his business partner from the money they've been laundering for the drug cartel, so with a gun to his head he convinces the crime boss (Esai Morales) that he can return those missing millions. 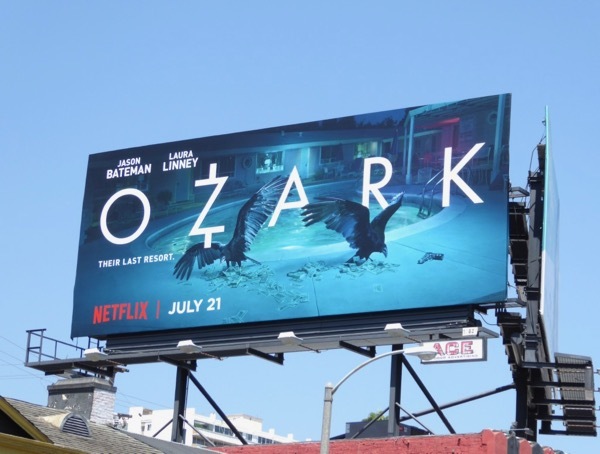 With law enforcement agencies keeping Chicago under surveillance he goes off the grid with this family in the Ozarks to start cleaning cash, but the FBI soon starts following the money and dead bodies as things turn deadly. 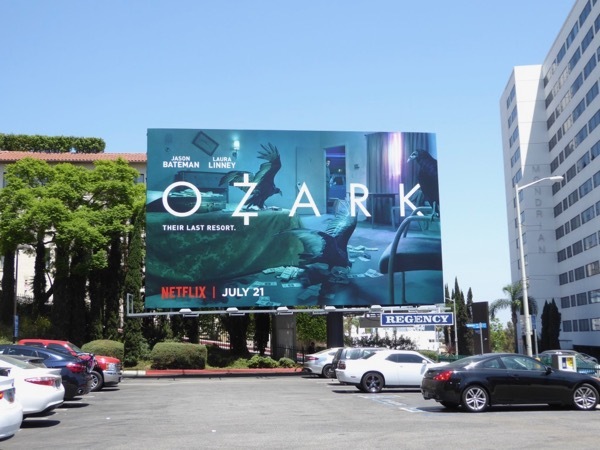 Things get even more complicated when he soon discovers that the local Ozark business owners may not be the easy marks he took them for. 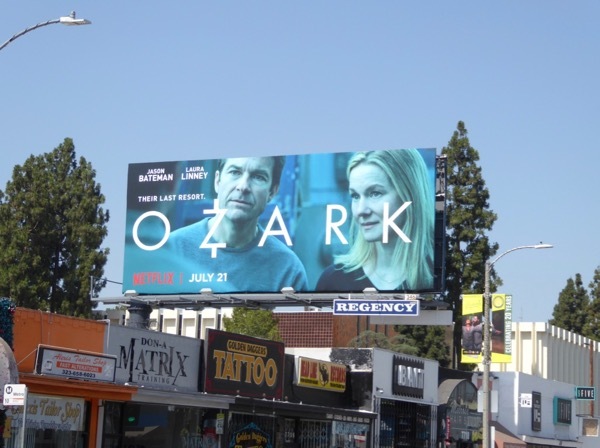 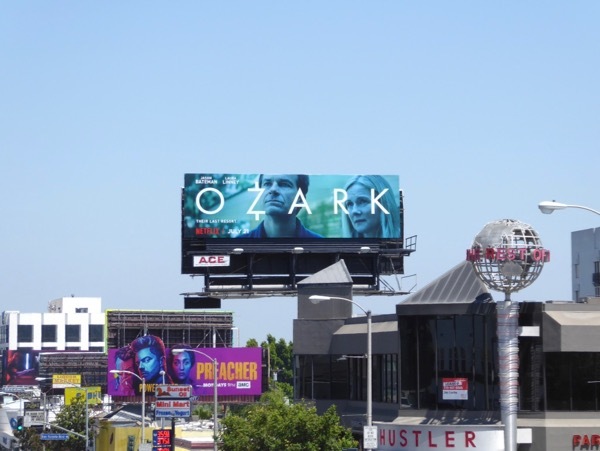 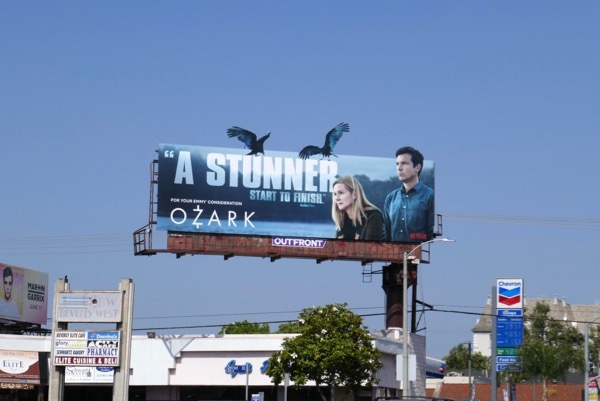 These dramatic Ozark series launch billboards were spotted around the streets of L.A., including the Sunset Strip and Melrose Avenue, from July 17 to July 21, 2017. 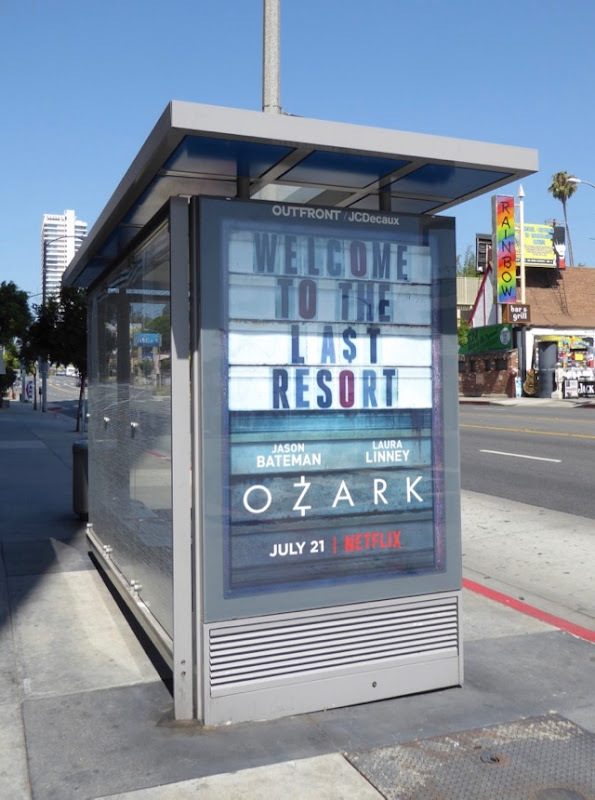 Fans of Jason Bateman can also check out these Arrested Development billboards, this movie billboard for This is Where I Leave You and these Horrible Bosses movie billboards. 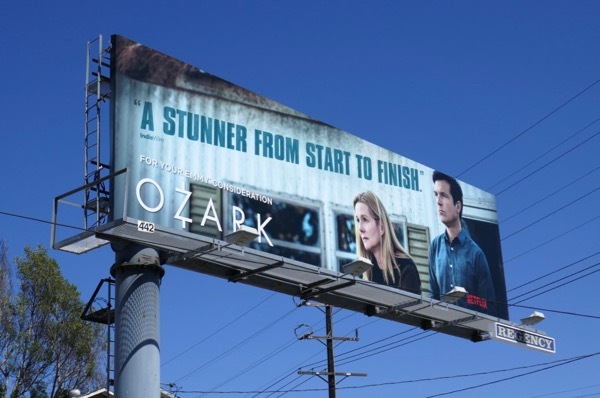 Meanwhile admirers of actress Laura Linney can also enjoy these billboards for The Big C television series. 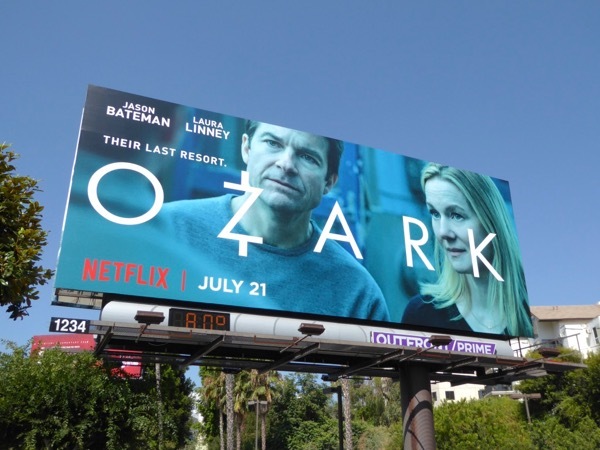 It looks like Ozark won't be the laugh-a-minute comedy we're used to from Jason Bateman, but that's not a bad thing and Daily Billboard could watch Laura Linney all day, so let the binge-viewing begin. 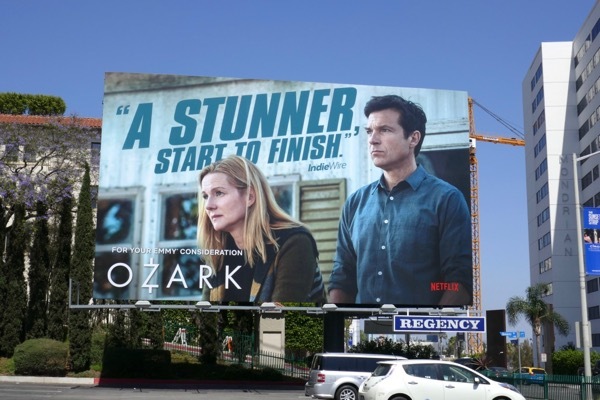 UPDATED: Congratulations to Ozark for nabbing a Golden Globe nomination for Jason Bateman, plus a SAG Award nomination for the actor and for Laura Linney. 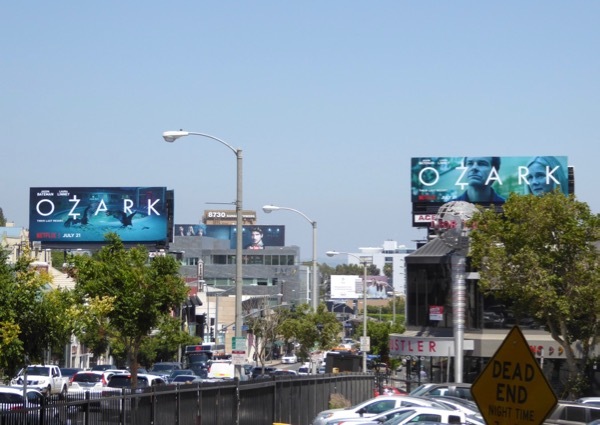 Here's an awards nomination billboard for the Netflix series snapped along the Sunset Strip on December 28, 2017. 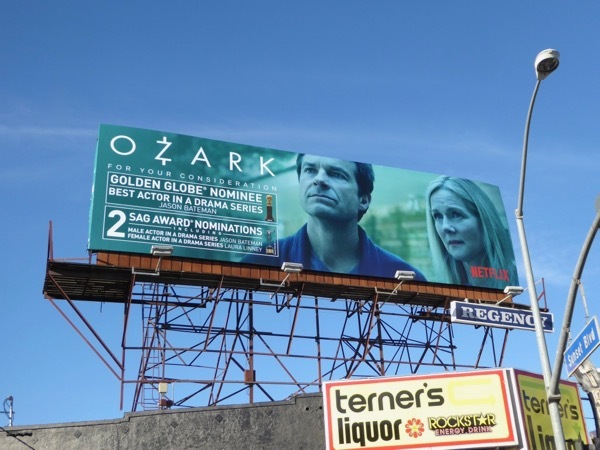 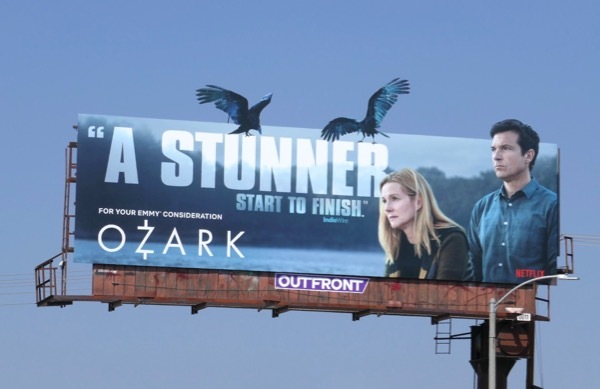 UPDATED: Ozark may not have won any of its Golden Globe or SAG Award nominations, but that hasn't stopped Netflix from reminding TV Academy voters about its gripping drama with this stunning Emmy consideration billboard. 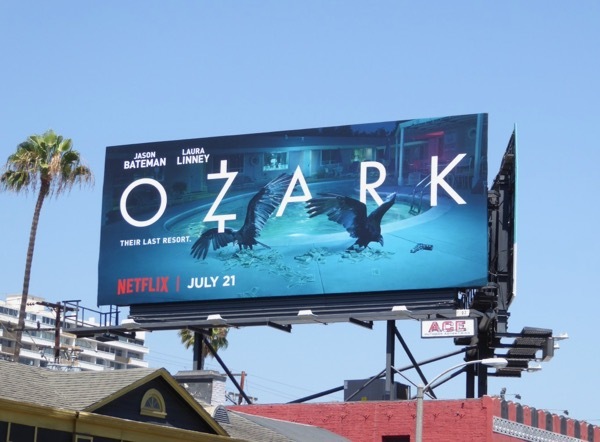 Special extensions always help billboards stand out and this example with the added cut-out crows is no exception and was snapped along Beverly Boulevard on May 23, 2018. 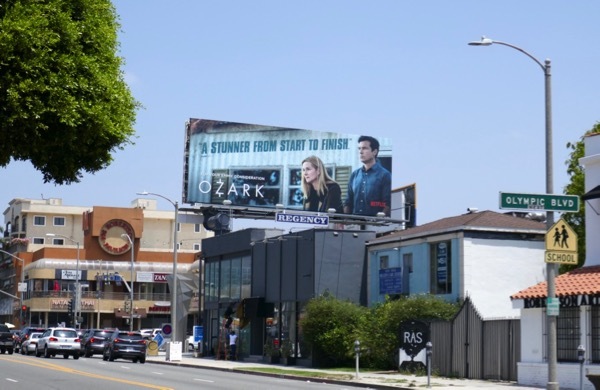 Plus here's a standard landscape billboard for the Emmy consideration campaign, spotted along Melrose Avenue at Vine Street on May 25, 2018. 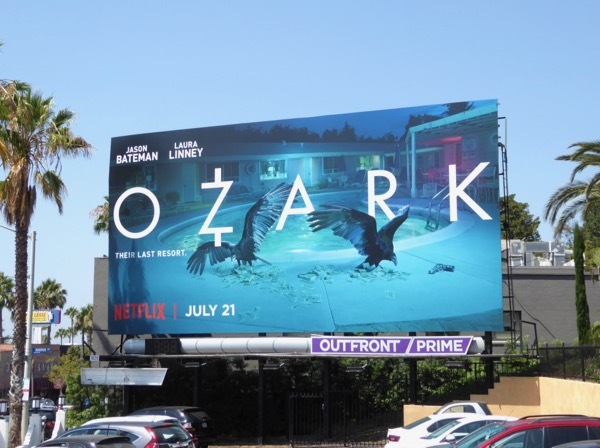 And another standard version spied along Robertson Boulevard on May 28, 2018. 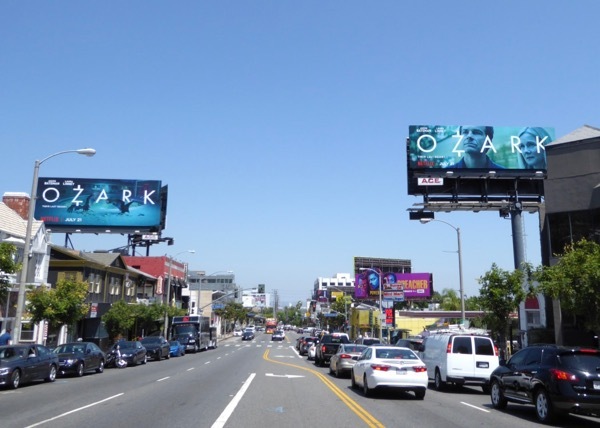 Plus here's another larger billboard spotted along the busy Sunset Strip on June 6, 2018. 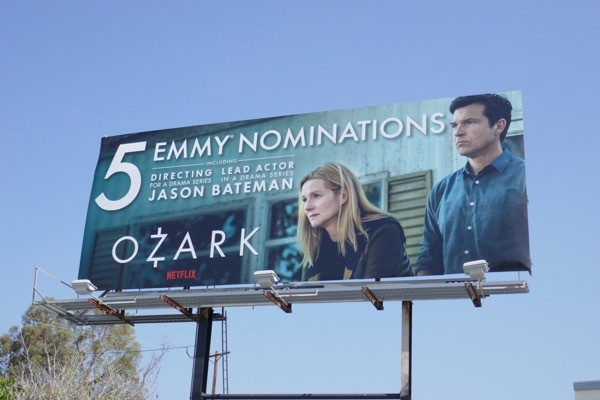 UPDATED: Congratulations to Ozark for scoring five Emmy nominations for its debut season, including for Jason Bateman as Outstanding Lead Actor and for his Outstanding Directing, amongst other nods. 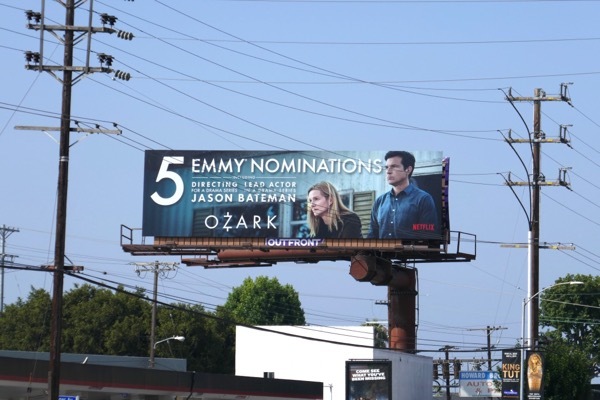 These Emmy nominee billboards were spied campaigning along Olympic Boulevard and Robertson Boulevard from August 17 to August 19, 2018.